Sickle cell anemia is a disease that warps red blood cells into a sickle like shape due to problems with their hemoglobin. Hemoglobin resides inside a red blood cell and carries oxygen from the lungs to all other parts of a body. Healthy hemoglobin stays in a liquid state while residing in the red blood cell and thus allows the red blood cell to be soft and flexible. It is important for a red blood cell to be flexible so that it may squeeze through many small veins in the circulatory system. Hemoglobin affected by sickle cell anemia has the tendency to change from a liquid state and form a crystalline structure that warps the red blood cells shape and hardens it. This makes the affected red blood cell unable to travel all over the body and in some cases can clog veins and arteries because of the texture and shape. 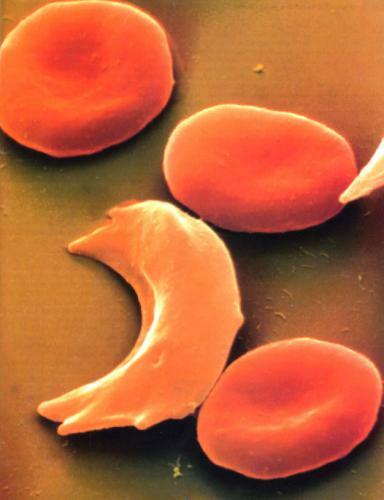 Sickle cell anemia also permanently damages the distorted red blood cells and thus triggers the body to kill them off. This can lead to a shortage of healthy red blood cells, which means a lack of oxygen to the many parts of the body. Sickle cell anemia is passed on to new generations through genetic lineage. Even if both parents do not have sickle cell anemia, it is possible one of them may carry a dormant gene for sickle cell anemia. This disease can then be transferred to a child whose genetic makeup may or may not keep the damaged hemoglobin gene dormant. In America, there are numerous tests one can take to see if they are a carrier for the disease. Laboratories can then determine the chances of their future children having the disease. Miriam Bloom, Understanding Sickle Cell Disease (Jackson: University Press of Mississippi, 1995).